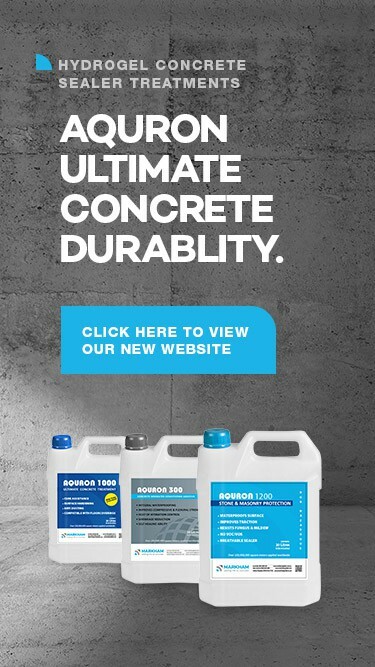 AQURON ULTIMATE Concrete sealers and Concrete Waterproofing treatments are available to the Australian concrete and construction industry from MARKHAM GLOBAL Australia. MARKHAM GLOBAL Australia is dedicated to providing high quality concrete sealers and concrete waterproofing innovations for the Australian concrete and construction industry. MARKHAM GLOBAL also has offices and representation in New Zealand and United Kingdom. MARKHAM GLOBAL Australia is focused on the AQURON ULTIMATE range of water based NIL voc, non-hazardous concrete waterproofing treatments, concrete sealers, and sealers for masonry and stone. Developed in Texas, USA in 1984, AQURON concrete sealers, concrete waterproofing, concrete hardeners, and concrete protection have been proven in Australasian conditions for over 15 years. AQURON ULTIMATE range includes concrete waterproofing treatments and additives, moisture control treatments for beneath floor coverings, concrete sealers for curing, hardening and anti-dusting high performance concrete floors, along with sealers, water repellents and treatments for polished concrete, pavers, masonry and stone. MARKHAM GLOBAL's Australian team are continually researching products and systems that are more environmentally friendly, cost effective, easier to use and of course innovative for Australian conditions. 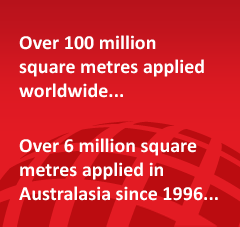 Our Australian team looks forward to helping you with any questions relating to how our products can help you achieve the best solution for your projects. To extend the service life of concrete structures, with more environmentally friendly solutions and systems, that gives people the opportunity to protect structures today for future generations. Providing systems and solutions that help to improve performance and extend durability of concrete structures, with a focus on reducing environmental impact.